In the process of preparing the meals and recipes for my next book, which is all about cooking with food storage, I’ve run into the problem of meats. The big question is, how to do meat dishes with shelf-stable ingredients. Shelf-stable, of course, implies ingredients that can be pulled from long-term storage on a shelf. That does not include frozen meats. It’s a good thing to have a good supply of frozen meats in your food storage, don’t get me wrong. It’s great to thaw them out and cook up good meats. However, even those can be subject to freezer burn, and if your power goes out for more than a few days, you’re in trouble. That leaves you three options: Dried meat, canned meat, and fake meat. None of these are ideal, and we will all swear up and down that fresh meats are the best, because they are. However, if you use these properly, with good ingredients and seasonings, you can cook up dishes that are delicious, filling, and still provide the protein you need. I cooked up some things last weekend, in preparation for the book, that use some shelf-stable meats. One was the jerky chili that I did a few months ago, found here. That was a tasty example of using dried meats. 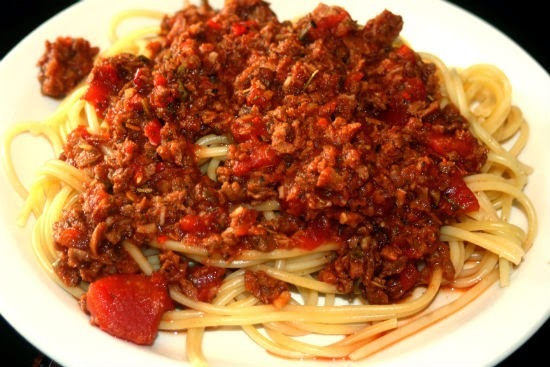 I also made a spaghetti sauce using beef flavored TVP. This is “Textured Vegetable Protein” and it’s a staple of the vegans. It has a texture very much like ground meat, it carries various flavorings, and it’s made entirely from soy, so there’s no animal products. It also is dried and stores forever. We had in our food storage a number of #10 cans of this stuff, in various flavors, like chicken, beef, and bacon, but I was always afraid to try it. The mere thought of smooshy fake meat made me run for the hills. But I tried it this weekend, and my results were good. I started by lighting up some coals, and once they were hot, I set up the 8” Dutch oven and the 10” Dutch oven with their respective coals, with water in the 10” and stock in the 8”. I put the lids on, and waited for them to boil. The stock, being the least, boiled first, so I dealt with it first. TVP should be mixed with boiling water at a 1:1 ratio, so I tossed in the cup of TVP and stirred it up. It absorbed the liquid almost instantaneously. I mixed in the tomatoes and the tomato sauce, and stirred it up, replacing the lid. I pulled away some of the coals, because I wanted it to begin simmering, and not to burn on the bottom. Then, I added in all of the other flavorings, and kept it simmering. About then, the water in the 10” was boiling. I tossed in the spaghetti sticks and reclosed the lid. in a few minutes, they had softened, so I stirred them up to keep them from sticking. After about 8-10 minutes, the spaghetti was “al dente”, which means that it’s not so soft. It still resists your tooth a little bit. I strained the spaghetti out of the water, and served it on the plate, smothered in sauce. I also sprinkled some parmesan onto it, which, technically, isn’t shelf-stable, but it’s certainly moreso than softer cheeses. The final verdict? I was impressed. Had I not known it was TVP, I might have thought it was ground beef. In this particular dish, there are a lot of other flavors to distract the tongue, so not so much attention is paid to the flavor or the texture of the TVP. If I were to eat the TVP straight, or if it were a bigger part of the dish, I’m not sure how well it would do.